Published on March 23, 2018. 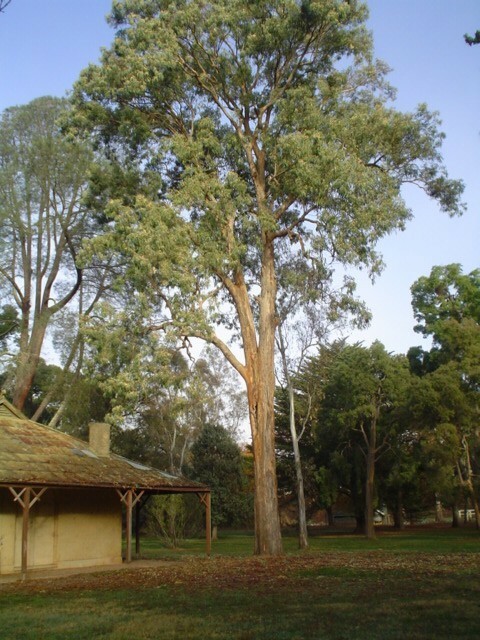 To celebrate National Eucalypt Day we have dived into our archives to find some interesting stories and rare species of Eucalyptus on our Significant Tree Register. There are many more to be found through our Register at www.trusttrees.org.au. On the register for is curious growth form and abnormal outgrowths, this is a very unusual example of this species displaying a pronounced weeping habit. The heavy weeping foliage often shears off the branches, many of which are 15cm to 20cm in diameter. The tree was planted in 1913 as part of a species trial at the Nursery. A smaller example, also displaying weeping form, occurs nearby. The nearby Wail Nursery is the Wimmera and Mallee’s premier location for local native plant species, recently re-opened for retail sales in 2017 as a partnership between the Barengi Gadjin Land Council and Narri Seed. This tree has an unusual history.The cavity in the trunk was used in the days of coach transport, around the latter half of the 19th century, by mailmen and the Tyntynder Homestead residents to leave or collect mail when there was flooding in the district. 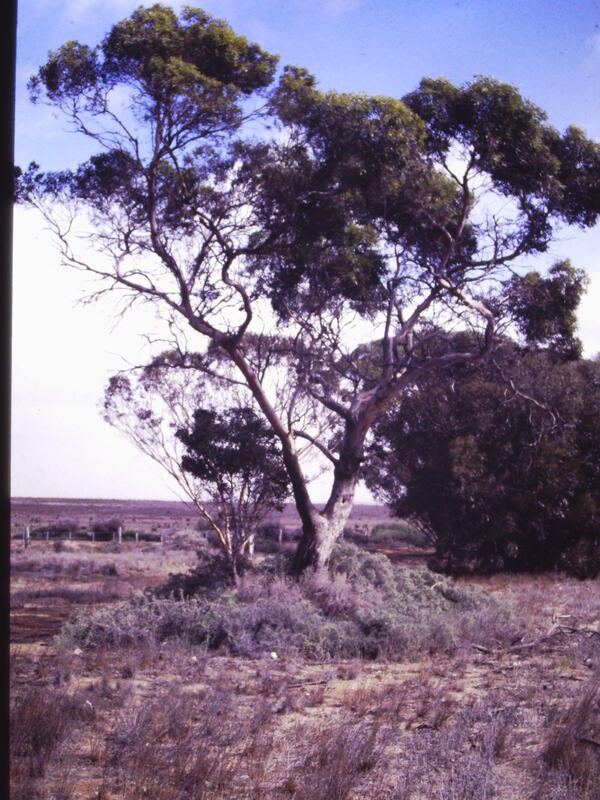 It is part of remnant native vegetation of the area and Swan Hill is the most eastern extremity for occurrence of the species.This tree is located opposite the entrance to Tyntynder Homestead; settled about 1846 as one of the earliest pastoral runs in the district. 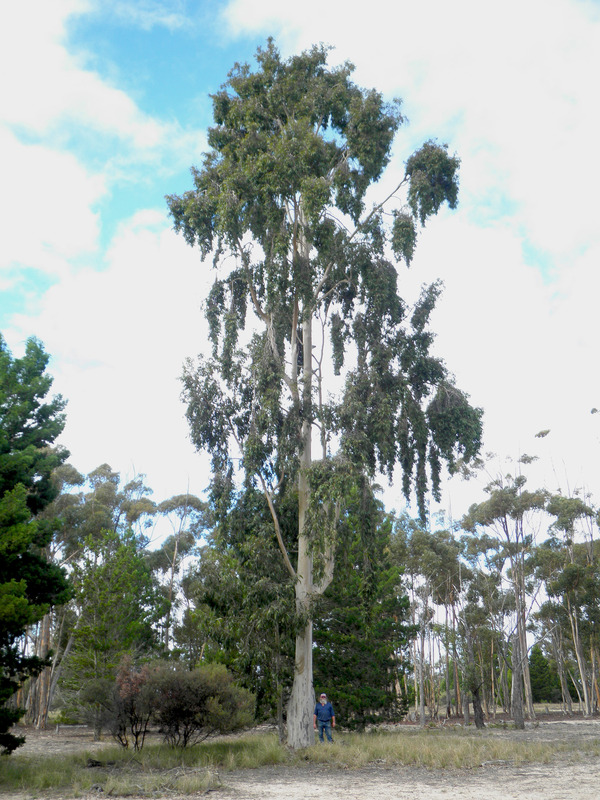 In Victoria, Eucalyptus aggregata is found in a small number of locations in Victoria. One of these is nine small stands in seasonally inundated ‘ frost hollows’ around Woodend. Otherwise the species occurs mainly on the NSW south and central tablelands, but is not common. 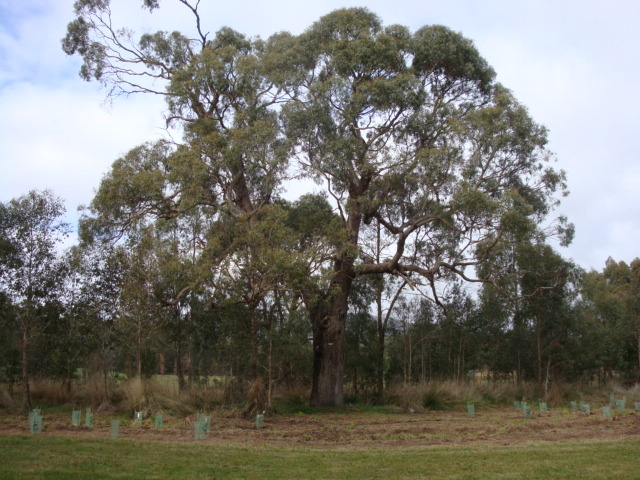 The stands were surveyed by the Department of Botany at LaTrobe University in the early 1980s, when working on the distribution and conservation status of plants which are rare or endangered in Victoria. They consider the Black Gum to be rare, particularly as some of the stands surveyed do not contain juveniles. We have these nine stands included our our Register, including at Woodend Recreation Reserve, Roadside reserve 1km west of Woodend Post Office, and the Railway reserve, 1.6km south-east of Woodend Post Office. To see all stands search Eucalyptus aggregata in our Register. 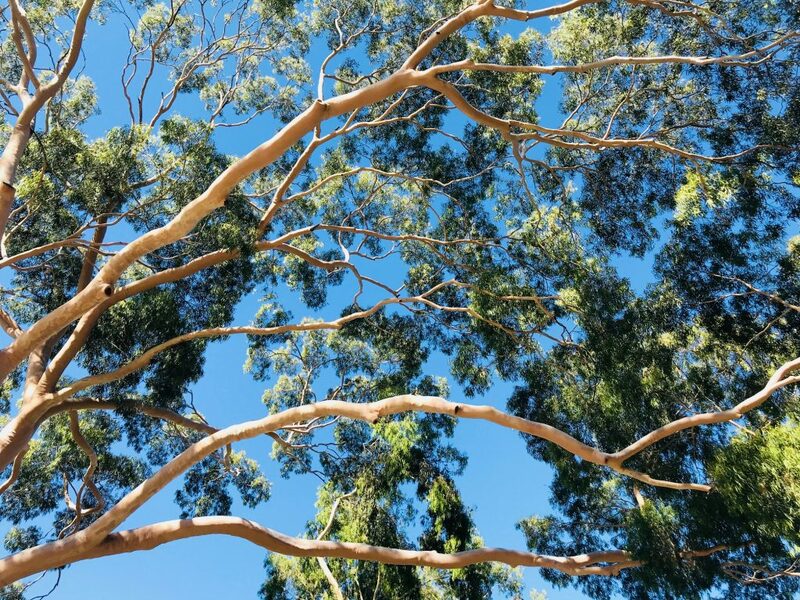 You can find out more about Eucalyptus aggregata here. This species is native to the coastal strip of South -West Australia. 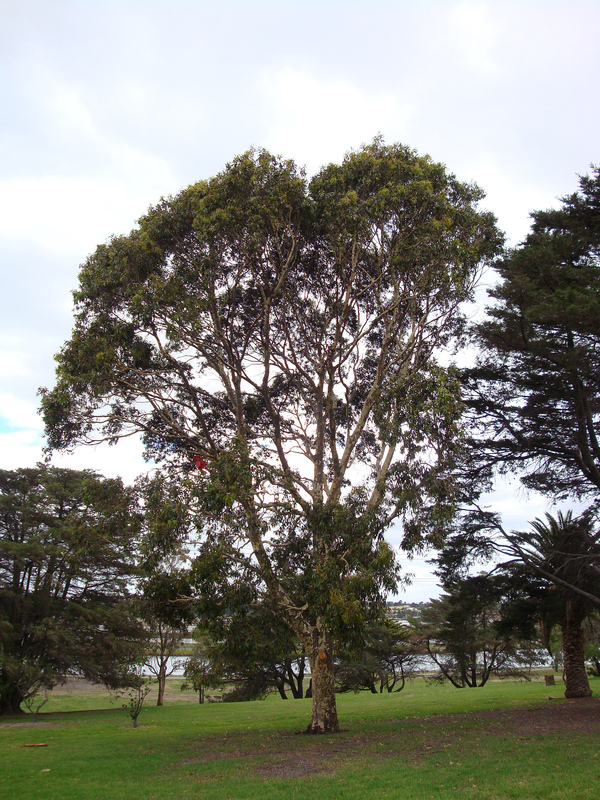 Baron Von Mueller is known to have traveled by sea on a collecting journey to Western Australia in 1867 and it is possible that a seedling of this tree and the two smaller specimens in this location were bought back by him and planted in this location on his return. This is a good example of this species for the age of the tree. 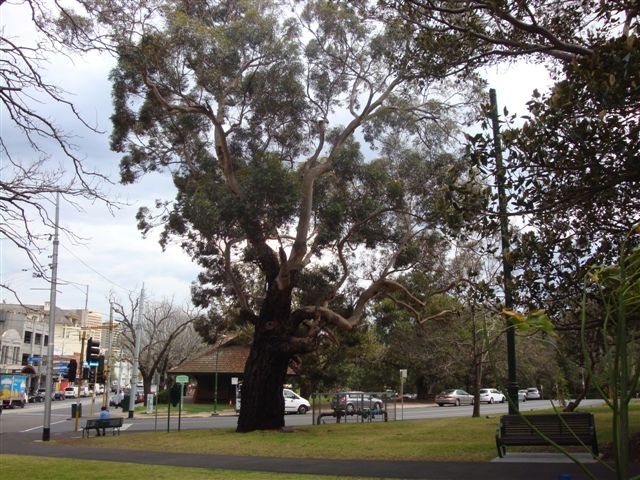 This tree is located in Rotary Park in the south-west corner of the Domain Parklands which was planted and landscaped in parallel with the Royal Botanic Gardens and Government House. This species is native to the coastal open forests near the Victorian border to Newcastle, NSW and is rare in cultivation. The only other examples known in cultivation are at Tonghi Creek State School, East Gippsland. E. longifolia is a member of the myrtle family and has thick, fibrous bark usually colored light gray and white, with long narrow grey-green leaves. The drooping flowerheads in groups of three are a distinguishing feature. This tree is located near old Kiosk. At the eastern end in playground area in Footscray park, this well-rounded mature specimen, although cultivated more widely in Northern Australia, is uncommon in cultivation in Victoria. The species was previously known as Angophora cordifolia. Footscray Park is important for its fine collection of garden structures, ornamental ponds, formal and informal path layout, and a rich plant collection. Find out more about the Footscray Park here.